Home » Blog » News » What Is Aeration? Heavy foot traffic. Running around, even walking, on your lawn can cause soil compaction. This is especially true if you have children or pets playing in the yard. Home construction. It’s quite common for the topsoil of newly constructed lawns to be stripped away and grass re-planted on subsoil that has then been compacted during construction. Sod layering. Sod is installed over existing soil and needs to be aerated annually to ease compaction and improve drainage. Aerating your lawn relieves the compaction, allowing all the necessary nutrients to reach the roots of your turf to improve the health of your grass. The process also works to improve drainage and reduce any thatch—often indicated by a dry, spongy feeling—built up within your landscape. Ideally, Northern Virginia lawn aeration should be performed once annually in the early fall, when the days are warm and the nights are cool. We recommend having your aeration appointment completed by October at the very latest. This allows the roots to strengthen over the winter months so the seeds can blossom when spring comes. Since aerating your lawn is so important, this is a service that typically fills up quickly. Be sure to book early to guarantee service when you want it! 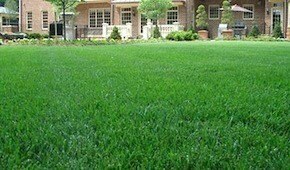 At O’Grady’s Landscape, we specialize in all aspects of Northern Virginia lawn care, and aeration is our expertise. Our landscapers have extensive experience providing lawn aeration and overseeding services to homeowners all over North Arlington, Great Falls, the City of Falls Church, McLean, and Vienna, and we always strive to offer the best customer service experience. We can also provide you with overseeding in the same appointment to protect your turf from disease, drought, and insects. The combination of services promotes thick, weed-free growth. We want your lawn to be as healthy and green as the day it was installed and will provide the highest level aeration service to make that happen. Give us a call at 703-533-5001 or fill out an online contact form for an estimate on aerating your lawn this fall!